In Jean-Luc Godard's Masculin-Féminin, a character expresses disappointment in going to the movies, saying, "It wasn't the film we had dreamed, the film we all carried in our hearts, the film we wanted to make...and secretly wanted to live." 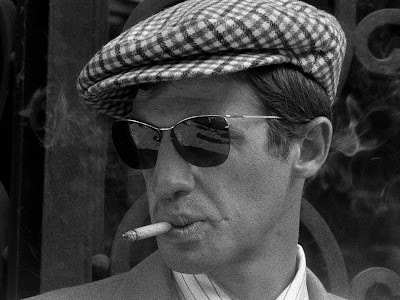 Michel (Jean-Paul Belmondo), the lip-rubbing petty thief of Breathless, carries the films of Humphrey Bogart in his own heart, modeling his attire, attitude, and "ticks" after the revered actor's trademark hard-boiled on-screen persona. To this point, Breathless, released in the U.S. 50 years ago today, is the movie Michel wants to make and secretly wants to live. Not unlike Harold & Kumar or Pineapple Express, Breathless, Godard's trailblazing French New Wave film featuring a rough, naturalistic documentary style, a big noir score, a plethora of jump-cuts, and Belmondo's irresistible performance, exists as a revision of a personal legacy, presenting events as the character prefers we see them, no matter how biased or how untrue they are. He may be a poor Frenchman's Bogart (or "Bogey" as he fondly refers to the actor), but that's OK, since this is Michel's film. He strolls around town stealing cars, hitting up sexual acquaintances for cash, assaulting bathroom patrons, and flipping up women's skirts. A man-child, or as much of a man-child a late-20-something can be, he possesses the body of a male model but the face and attitude of a rambunctious teen. He's a more abrasive Antoine Doinel from The 400 Blows (not surprising, as Truffaut wrote the story of Breathless for Godard to turn into script and film), but he's a version who grew older without ever growing up. After a particular run-in with a cop ends in murder, Michel returns to Paris on the lam, in search of money and the company of one particular gal, Patricia (Jean Seberg) — a New Yorker. When you and I watch Breathless, we're seeing Michel's attempt to override what I would guess is his true legacy as a petty criminal killed while trying to resist arrest. He takes this opportunity to glamorize his final days, portraying himself as an outlaw living dangerously until the end, hunted down by the bumbling (though surprisingly informed) police, blaming his eventual death on the dame he was foolish enough to fall in love with. It's not clear what's true and what's fantasy in Breathless (well, not always clear), but that's irrelevant to a romantic like Michel, most evident in the film's final sequence. With the cops on their way to arrest him thanks to Patricia's betrayal, Michel does the "noble" thing and decides to stop running and turn himself in, only to be shot when the police see a gun in his hand — a gun he certainly never intended to use. He stumbles down the block (and keeps stumbling...) as his love chases after him, regretful and ashamed, until he finally collapses at death's door. Ah, but before he goes, in a final poetic stroke, he grants Patricia a sign of forgiveness through an inside-joke — in some ways, his own personal "here's looking at you, kid" — and as he passes, Patricia professes her love for him one last time by mimicking his trademark lip rub...which of course he stole from Bogart. The legacy and influence of Breathless is well-documented and undeniable, which is all fine and dandy, but for someone half the film's age seeing it for the first or second time, that impact can sometimes get lost. But the film still stands on its own. Godard's then-novel usage of jump-cuts match Michel's unrefined and impulsive personality, and the director's belligerent flouting of the cinematic conventions of the day certainly serve to showcase the prowess he continues to employ in subsequent films, but the key to Breathless, for me at least, is Belmondo's simultaneously charming and saddening performance as Michel. The character is undoubtedly obnoxious, but that's why he's so darn appealing. He yells at cab drivers, declares that women shouldn't be allowed to drive, and tries desperately to sleep with Patricia again and again (getting slapped a few times in the process). Belmondo plays him as an unapologetic rapscallion, a man convinced that this is the only way to go through life, rewriting his final days to reflect the much more romantic way he wishes things had ended. Seen in that light, Michel becomes even more tragic, and somewhat pitiable. Even in his fantasies, he's no more than a derivative small-time crook to his final breath's end. I know I should watch this again, but every time I have, I've failed to warm to it. In fact, it took me a long time to warm to any Godard, but then I finally did find some I enjoyed such as Band of Outsiders, A Woman Is a Woman and Tout va Bien, so maybe it's time to revisit Breathless. For me, like I mentioned, it's not so much Godard that I warmed up to when it comes to this film, but rather the character and performance of Michel. I couldn't say no to him.